The holidays are in full swing. Though Vero Beach, Florida doesn’t see the same seasonal changes like other places in the country, we still know that Santa Claus is on his way with his reindeer, sleigh, and bag of toys for all of the good girls and boys. But with that sleigh and reindeer, Santa may accidentally cause some damage to your house, especially the roof. What’s the best way to prepare your roof for Santa’s arrival, you ask? Well, the best residential roofing company in Vero Beach, The Roof Authority, has a few suggestions to help you spruce up your roof for old Saint Nick before he makes his way to your house. We’ll go over a few at-home roof maintenance tips you can complete with a simple trip to the hardware store, but if you need any professional assistance in fixing up your roof before Santa stops at your house, be sure to contact The Roof Authority for your roof repair needs. 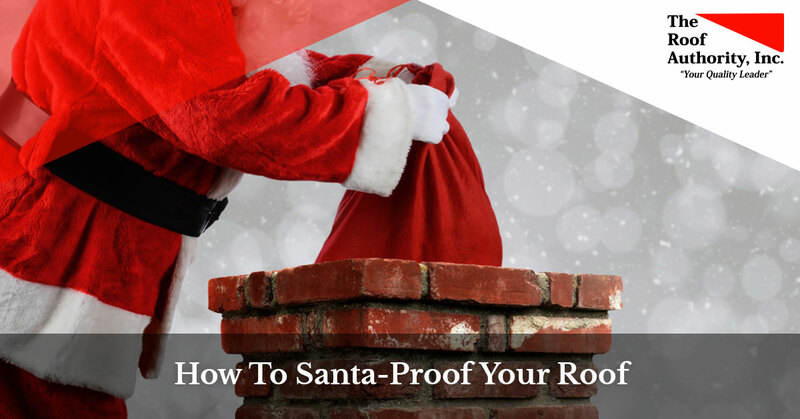 So, without further delay, let’s get into the best ways to Santa-proof your roof. Reindeer aren’t known for being the lightest of animals, even the ones that can fly and have shining red noses. Neither are big sleighs containing gifts for all of the good girls and boys. To avoid any Santa-related damage to your roof, make sure your shingles are all still healthy and hanging properly on top of your home. You can see the general health of your shingles from the ground floor. If you see any patches of missing shingles, shingles in your yard, or dark/oddly colored areas on your roof, then it may be time to call a professional roofing contractor to come inspect your roof. If you need to get a better look at your roof, break out the ladder and safely climb up to your roof to inspect it more thoroughly. Natural weathering will occur on all shingles, but if you notice major cracks or gashes in your shingles, a large collection of shingle granules in your gutters, or mold growing anywhere on your roof, then it’s definitely time to replace your shingles. Healthy shingles will be able to protect your home from water damage, debris, and nine reindeer waiting for a large bearded man to drop off some presents. One of Santa’s biggest complaints is the multitude of dirty gutters he sees on his yearly flight, which is second only to stale cookies and no milk. Saint Nick brings up a good point for more than one reason. Not only are dirty gutters unsightly, but they can also be detrimental to the overall health of your whole house. When there’s too much debris in your gutters, they can begin to break away from your home due to the sheer weight put on them. This allows water to erode away certain parts of your home, which can then let water and pests like rodents and insects enter and cause damage to your house. If your gutters are clogged, more harm can happen to your home in the form of water damage. If there’s too much debris to allow water to flow freely through your home’s gutter systems, it pools up, which adds more weight to your gutters. It can also overflow and fall to the ground, causing flood damage or damaging your home’s foundation over time. Cleaning your gutters regularly will help stop this from happening and will definitely impress Santa when he finally gets to your house. However, if your roof and gutters need help, the professional roofing experts at The Roof Authority are more than happy to help. Santa loves trees, especially the gorgeous palm trees in Vero Beach because, well, he lives at the North Pole and only gets to see warm weather once a year. Trees can cause massive damage to your roof though, especially when Rudolph accidentally clips a branch that falls onto your house. Overhanging trees cause more debris to fall onto your roof, so things like leaves, water, and more will all be thrown onto your home. During storms or Santa landings, extra plant life can unintentionally fall onto your roof, and the natural chemicals in that fauna can break down or harm your roof. Removing the trees or shrubbery that hangs over your home can help reduce damage to your roof drastically. If you’d like to do it yourself, then be sure to carefully sheer each tree, and also remember to adhere to local codes and laws. Also, never trim a tree that isn’t yours, that’s a sure way to get your name on the naughty list. If you need help or advice on what trees may need to be cut or removed, The Roof Authority can help determine what plants may be potentially harmful to your home. With these tips, your home will be more than ready to greet Santa Claus. If you need a residential roofer in Vero Beach, then The Roof Authority is the company for you. Learn more about us, view our gallery to see what we can do for your home, or contact The Roof Authority to answer any questions and get your free quote.